How much is a photograph worth? A sweaty old man with his shirt pulled above his bloated belly and blowing cigarette smoke in our direction was asking us for $25 to climb up a karst hill. We were already hot, sticky and running a bit short on time and temper. We had paid more than we wanted to rent a couple of bicycles that were now chained to a tree several miles back due to unforeseen poor road conditions. We had forked over almost $10 for a three-minute ferry ride across a narrow river. I had a hundred photos of Yangshuo and Xingping already. How good could the view be? We floated the idea of simply turning back, but then grudgingly handed him the entrance fee, passed through the turnstile and climbed the steep staircase. As we rounded the bend at the top of Xianggong Mountain and exclaimed "wow, oh my god! ", I decided the view was worth the money... and the effort and sweat it took to bike and hike here in the heat and humidity. Yangshuo in Guangxi Province used to be a quaint, quiet backpacker haven "off the beaten path". Today, it is a major tourist destination for local travelers in China and has blossomed into a large, well-established city, accessible from Guilin in just 30 minutes via a high speed train. 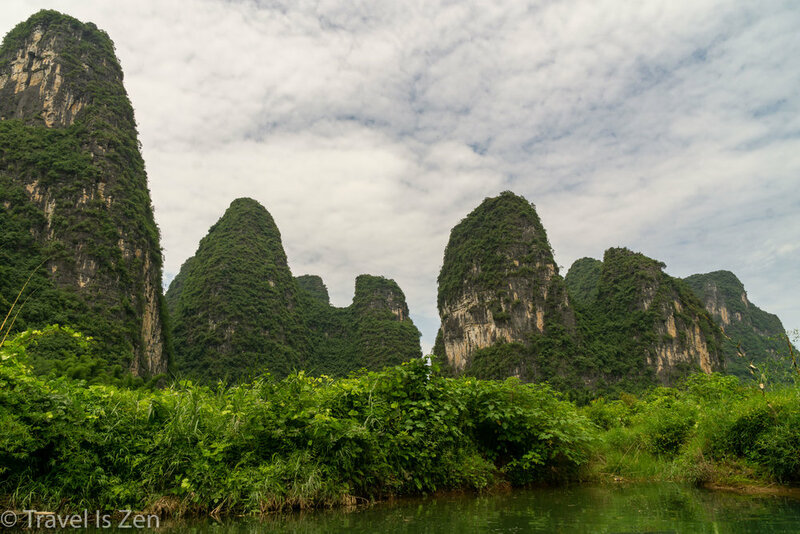 With magnificent lush, tropical karst landscape and two major rivers, there is a lot to see and do in Yangshuo, including biking, rafting, hiking, river cruises, and swimming (just for starters). Knowing that Yangshuo has become a bit of a tourist madhouse, we opted to stay in Xingping, a smaller up-and-coming village on the Li River, forty minutes north of Yangshuo. Featured on the back of the Chinese 20 yuan banknote is Yellow Cloth Shoal, a scene along the riverbank in Xingping. The high speed train rail station, Yangshuo Station, is actually located in Xingping. By the time you read this, Xingping will have already grown exponentially. When we visited in the spring of 2018, it was bursting at the seams, with new construction in all directions. The small but scenic "ancient town" area is being preserved, though. We spent a total of three nights and four days in Xingping; we rode the public bus to Yangshuo one time for a bamboo rafting experience. During the afternoon, Xingping was overrun by street vendors and day-trip tourists from Guilin and Yangshuo. The mornings and evenings were calm, though, and we enjoyed watching the local people relax in their "off" hours.